Bereaved families can expect time, privacy and the best possible quality of service when they book their funeral ceremonies at the South Leicestershire Memorial Park and Crematorium, which opened earlier this year. 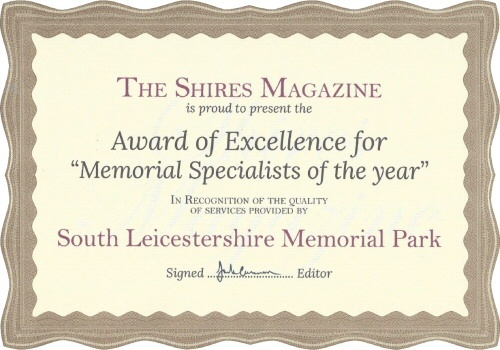 The exceptional facilities and standards offered by South Leicestershire Memorial Limited gain the company the Shires Magazine Award of Excellence as our Memorial Specialists of the year 2015/16. One of the winning features is the full, private hour afforded as standard for each and every service, instead of the usual 20/45 minute slots allocated by most crematoria while other bereaved families queue outside. A second hour can be booked if wished for only £100. Surroundings both inside and out provide an immaculate serene setting for the sensitive matters in hand. The comfortable crematorium chapel can seat up to 100 people and is equipped with hi-tech music systems, screens to display family photos and a webcam to stream the occasion for people unable to attend in person. Using outdoor amenities, procedures can be conveyed to 400 attendees.